The Journal of Ceramic Science and Technology will publish original research relating to all categories of ceramic materials. Articles on basic research as well as processing and application of ceramic materials are welcome. Papers may have either theoretical or experimental character. Submission language is English. To sustain a high standard of the journal all manuscripts will be reviewed in a double-blind peer review process by at least two international experts and the journal editors. Only contributions that have not been submitted or printed elsewhere will be published. Once a paper has been accepted for publication, its copyright is transferred to the publisher of the Journal of Ceramic Science and Technology (Göller Verlag GmbH, Baden-Baden, Germany). 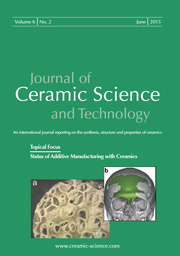 The Journal of Ceramic Science and Technology is a fully open access journal. The article publication charge for all articles is 1300 Euros. Open Access has many benefits for science and the general public. Free online articles are more highly cited because of their easier availability. All articles of the Journal of Ceramic Science and Technology are published under the terms of the Creative Commons Attribution License (CC BY) which allows users to copy, distribute and transmit an article, adapt the article and make commercial use of the article. Papers can be submitted electronically via the internet platform only. To enable online submissions, authors must first register and provide all required data like e-mail address, affiliation, etc. The editorial management and peer review system will support authors and reviewers to process their papers online. The editors may return manuscripts which are not in accordance with the detailed instructions for manuscript preparation or that do not fit the scope of the journal prior to the reviewing process. The journal forwards an accepted paper to Göller Verlag. When composed page proofs are available, Göller Verlag forwards them to the author for final review and to answer any editorial questions that may have resulted from editing the manuscript. The author should return the corrected page proofs as directed by Göller Verlag. If none are returned within two weeks. Göller Verlag will proceed with publication as edited. When starting the submission process, authors first need to choose between different article types e.g. Original Article, Review, etc. Afterwards authors will go through several submission steps where they enter various required or optional meta data like title, abstract, keywords, information about other authors, etc. To complete their submission, authors can upload documents in the last submission step. Some submission items, e.g. manuscript, are required while others are optional. All items need to be uploaded separately to avoid embedded documents e.g. figures in the manuscript. Authors should also take care that the properties or the data file names of their uploaded documents do not include their names so as not to reveal their identity to the reviewers. The main text should not include any author-related information (see “Cover Page, Primary Manuscript File”) nor embedded elements like figures or references. Each paper should be divided into different sections such as introduction, experimental, results, discussion, conclusion, and acknowledgement. References should be cited at the appropriate point in the text by a superscript numeral. They need to be uploaded separately. Mathematical expressions should be presented in an unambiguous manner. Every symbol has to be defined and multiple meanings have to be avoided. SI Units should be used for all data. If it is necessary to quote other units, these should be added in parentheses. The manuscript has to be written using proper English style and grammar. Add references or tables and figure legends in the separate submission items “References” and “Captions”. font size and standard fonts. References must be uploaded as a separate submission item. References should consist of a list of citations, in the numerical order in which they appear in the paper. References to periodical papers must include the authors' names, paper title, periodical title, volume number, page range, and year of publication. Book references should include authors' names, chapter/ section title, page range, book title, editors' names, publisher's name and location, and year of publication. Papers from proceedings should include the location and date of the relevant meeting, as well as the name and location of the publisher and the year of publication. Patents should include authors’ names, title, application number and year of publication. Non-English titles of books should include the English translation of the title, in parentheses, following the non-English title. The layout for typical references is given below. Reed, J.S. : Principles of Ceramic Processing. 2nd edition. John Wiley & Sons, Inc., New York, 1995. McEvoy, A. J., Grätzel, M.: New developments in dye sensitized solar cell research. In: Ceramic Materials in Energy Systems for Sustainable Development. Techna Group, Faenza, Italy, 2009. Fessler, J.R., Merz, R., Nickel, A.H., Prinz, F.B., Weiss, L.E. : Laser Deposition of Metals for Shape Deposition Manufacturing. In: Proceedings of the Solid Freeform Fabrication Symposium. University of Texas, Austin, Texas, 1996. Halloran, J. W., Griffith, M., Chu, T.: Stereo-Lithography Resin for Rapid Prototyping of Ceramics and Metals. U.S. Patent Application 6,117,612, (2000). Figures need to be uploaded in a separated file: they are not acceptable as embedded files in the manuscript document. Each figure submitted must be clearly identified with a figure number which should be in order how they are cited in the manuscript. If there are several images used for a figure each component must be clearly labeled (Figure 1a, 1b, 1c, etc.). Illustrations should be submitted as electronic files at the appropriate resolution and the size intended for publication. Color images should be submitted in full color. The type area is 185 mm wide x 275 mm deep. Two columns, each 90 mm wide. Legends min. 7pt lettering after reduction. Micrographs are typically reduced before publication. Therefore magnification bars have to be used instead of magnification indicators, e.g., “200X” to make sure that scale makers are easy to read remove machine-generated information from micrographs. Add critical information in the current legend to the figure caption. Normally, manuscripts are published in black and white. Figures submitted in color will appear in color when published online. However, if color print reproduction is desired, the author must accept additional costs of 500 Euro per page. Also tables should be uploaded in a separate file: they are not acceptable as embedded files in the manuscript document. Each table submitted must be clearly identified with a table number which should be in the order in which they are cited in the manuscript. Each table with a concise title should begin on a new page. Captions of figures or tables need to be uploaded as a separated text document. This item should include a list of all captions in order how they are cited in the manuscript. Each caption must be clearly identified with the figure or table number. If a figure or table consists of several components, please ensure that the caption clearly indicates the significance of each part of the overall figure. There exists an additional submission item “Language Edited File”. This is for the internal production purposes of the Göller Verlag only and does not refer to the author submission process. Please ignore this.